Sadly, local Muslim residents are among the victims of rising international tensions. WA Police will meet students at the Kewdale-based college this month to provide safety tips and have offered to increase patrols if required. College principal Nasreen Ahmed now drives a different car to work after being verbally abused two weeks ago by a man in the car behind her at a set of traffic lights. The stranger used offensive language in relation to members of the Muslim faith and told her to go back to her country. Mrs Ahmed has lived in Australia for 24 years, her children are Australian-born, and she said the incident was ‘frightening’. ‘I did not reply knowing and understanding that there are maybe a few people like him who have no idea about what Islam really is,’ she said. The car she was driving that day had personalised number plates with her first name and Mrs Ahmed believed this may have caused the driver to identify her as Muslim and react. The college’s 1200 students are advised to take care on social media and not react to inflammatory comments. She said to date there had not been any reports of harassment towards students, but some women had been targets of verbal abuse. She felt the State Government and police were supporting the school well. ‘All people should stand together. We are all Australian,’ she said. 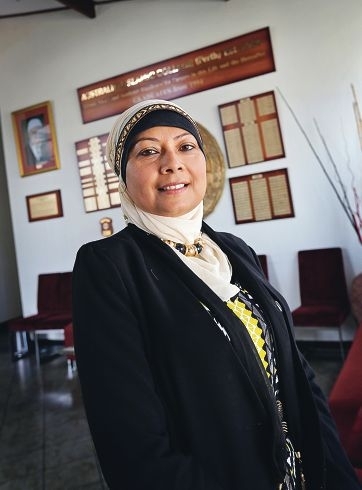 Muslim leaders, including those from Rivervale’s Islamic Council of WA, met Premier Colin Barnett and Multicultural Affairs Minister Mike Nahan last Tuesday to raise similar concerns. ‘Australia as a country has a history of respecting different cultures and faiths and I made it clear this type of behaviour is unacceptable to most West Australians,’ Mr Barnett said. Belmont MLA Glenys Godfrey also attended a school assembly on September 25 to express government support and East Metropolitan MLC Samantha Rowe visited the school to talk with the principal. The ICWA encourages members on its website to report religious or racially motivated hate crime to police on 131 444. Belmont police officer- in-charge Senior Sergeant Peter Arancini said he was not aware of any reports of racially-motivated harm, graffiti or vandalism.